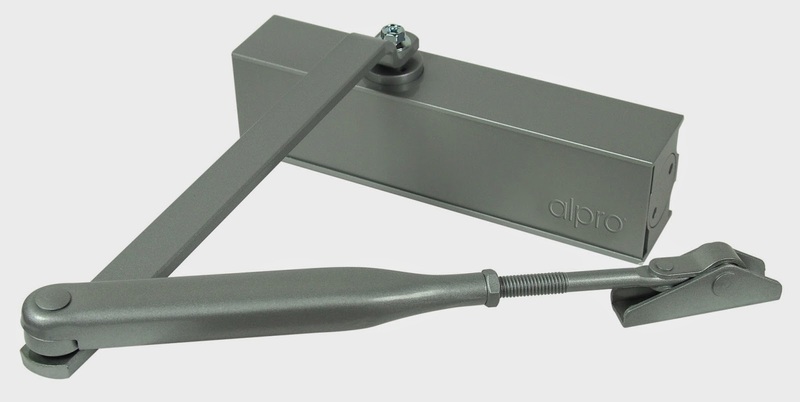 The Alpro Architectural Hardware Division of IEC Limited announces the release of their new “Optima” range of fully CE certified surface door closers. As a direct result of constant customer feedback for new products, the door closer range comprises, the Optima170 cam action closer with adjustable strength from 2-4, complete with sliding track and arm. The Optima 980 surface closer, with standard arm and the Optima 28A surface closer, strength 2-5 with standard arm and back check. All three closers come in an attractive silver finish. In line with current European and industry legislation, all three Optima closers have been independently tested here in the UK to the requirements of BSEN 1154 and have been certified for use on both fire and non- fire rated doorsets. The Optima range of door closers are suitable for right or left hand installation and are easy to use, install and adjust, in addition they are designed for retrofitting. The closers come complete with the necessary fixing instructions and templates, which again add to the ease of installation. Latching and closing speeds are adjustable. “The comprehensive performance specification of these units is excellent. The closers add to the aesthetics of any doorset and can be used in a variety of applications. They are easy to install and maintain, needing only a minimal amount of maintenance at any given time. This coupled with their reliability and excellent performance, makes Alpro Architectural Hardware, once again “First Choice for Locking Solutions”, illustrating our stated objective of a real “Commitment to Excellence” for all our customers”. Alpro products are available in the UK from IEC Limited and through all major security product distributors.